Have you ever wanted to move to a tropical island? Dancing in the dining room, Antigua West Indies is the story of one couples dream to move to a tiny island in the Caribbean. The story starts with why the author fell in love with Antigua over all the other islands she had visited. 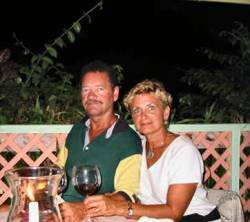 It highlights the obstacles and hard work involved when after twenty vacations to their favourite island Donna Goring and her husband Brian move to Antigua to enjoy island life. Once there she provides an insight into day to day life and her views on island life. They encounter many challenges, heartbreak and as they found out it's not always paradise. Donna Goring travelled to Antigua for twenty vacations during which time she wrote travel articles for newspapers and promoted the island at every opportunity. She became a supporter of an on-line newsgroup trying to help the first time traveller pick just the right resort, go the best restaurant or maybe find that special beach. After finally moving to her favourite island she wrote emails home describing life and their latest adventures to family and friends. They in turn encouraged her to write a book so that others could share her story. Donna is currently living in Richmond, British Columbia Canada with her husband Brian. 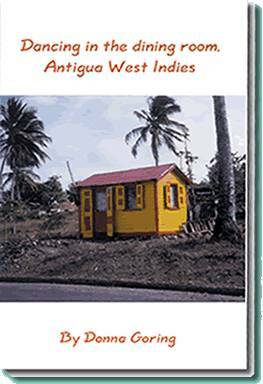 For anyone moving or thinking of moving to a Antigua or any Caribbean Island this book is a must read. Dancing in the Dining Room can be bought on-line as a paperback book or as an electronic book – to buy now click here. Now available on Amazon for kindle e-book readers here.